At first I didn’t get it. Change. The second album was a big change, and this one is as well, again. Yet, Ekpyrosis here present what they’ve been doing all along, more or less, only more uncompromised and focused than ever. This is the current pinnacle of their own kind of atmospheric black metal done their own -and only their- way. And I think it’s crucial, to grasp their current sound, to think about how atmospheric can black metal really get, plus how “warm” and “nice” can it really be produced while not stopping sounding like the real thing. There have been bands and albums that achieved a degree of, let’s say, shoegazy black metal; but often it gets so atmospheric that leaves behind the true essence of, say, classic atmospheric albums of quintessential black metal like Transylvanian Hunger. Let’s try and get as atmospheric and clean and nice sounding as it gets, without losing that essence, and I think the paramount example is Weisse Nacht, currently. I’ll put it this way: this is the blackest of blacks inside but it will get you moving up and floating in the clouds if you let it, just not in the same way as other bands have done before with varying degrees of satisfaction. The closest I can think of, without necessarily implying these two sound similar, is the debut album by Alcest. Only, that album sounded actually warm and nice and is like lying on the grass with the sun staring at you. Sure it can be melancholic but Weisse Nacht, while it may be a white one, is still utterly and ultimately a night. That ‘Souvenirs’ Alcest album (which I love) was mostly executed and produced as a black metal album, only it wasn’t. Weisse Nacht sometimes sounds like a bright shoegaze album played the black metal way, only it isn’t. It’s a black metal album that won’t make you smile unless it’s a satisfaction smile upon finding such a unique piece of art. Also, I like how black metal can be about anything but Satan and still appeal and be creative and credible and take you to a forest clearing and just gaze at the sky and be alone, just wondering, in relative peace. Or is it maybe. As I said, at first I found myself not being able to get into this album. 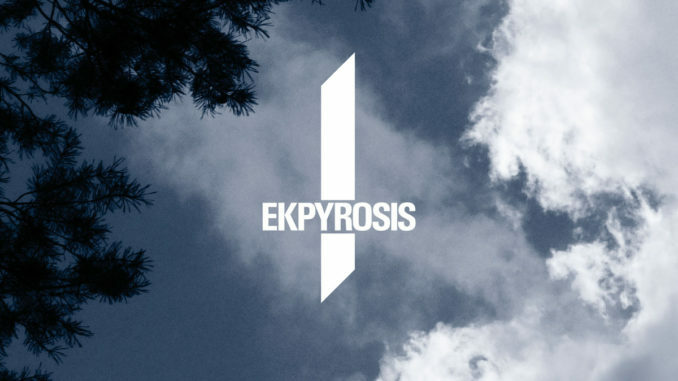 Ekpyrosis changed their sound in their second album, the deathed Ein Ewiges Bild, and I found about it while getting a bit disappointed, because I was expecting a continuation of their debut opus Mensch Aus Gold, which was a fairly black-metally album dealing with a lot of repetition, hypnonosis, atmosphere and weirdness. So good a lone and slowly evolving song lasting for more than half an hour. And this new album seems like a return to that sound, so there was no reason to not check it out, knowing both previous albums turned out great in the end, each one in its own way. But I found a very harsh redefinition of the debut’s style, with very fast and then even faster beats, and crazy vocals and screaming, which were not present in the debut. The fast beating was, but the drums sound was so muffled in the guitar wall-riffing that it only submerged more into the droning hypnosis, led by the (mostly) spoken word vocals. Definitely the second album has made its way into this one’s ingredient list, and that’s good. Because the deathly heavyness and the punker attitude make it a more complete work. Indeed, this is not an acquired taste, it’s just I was expecting what it didn’t offer, or at least I expected to receive it in another way. The debut was a single song that evolved slowly, as I said, and this album is a collection of individual songs that explore that very same concept, only with varying degrees of violence and shades of the same atmosphere. And it starts out rough but the other songs are either slower, heavier, mellower or whatever. And I realized that quality after having stopped caring about the album for several days in the first place; and then finding it absolute, in terms of individual songs, upon returning to it. Had I had that mindset from the beginning, instead of being conditioned by expectations, I would probably have enjoyed it from milisecond one. And milisecond one is when everything happens. The album starts with a high speed blast beat that only evolves in a faster one, and eventually falls to a more mid tempo be it with or without the high speed double kick drums, depending on if it’s the first or second iteration. And that’s the first song, which involves both harsh and clean vocals (as does all the album), and some disturbing melodies that eventually end up lifting your spirit up high. This song is probably the most violent out of the six that are contained in the album. And it already showcases the multilayered guitar melodies, quite grand and often extended in number of pulses; the small arrangements, and the touches that made the album’s sound so simple at times yet so complicated in scope, or at least carefully crafted. The harsh vocals in this album are more about screaming or singing in a rythmic way, while the clean vocals behave in two ways: one being the usual Ekpyrosis spoken word style singing and the other a more melodic chant that is present at some moments (there’s also some ‘la la la’ somewhere, which really is nice). When the vocals are aggresive and squarely rythmic the music is still very melodic. And the clean vocals usually come with more arrangements, some synth pads occasionally, but still at a time when the music can be a madly melodic riff at two thousand beats per minute. There are moments where it still sounds a bit deathened black metal, like the third song which features two riffs (and only two) that reminded me of golden-era Morbid Angel, but the song retains that Ekpyrosis signature of contemplation and staying in a metaphisical limbo where time doesn’t happen at a normal rate. And this influence of their second work is key to developing the longer songs, in which the spirit and progression of Mensch Aus Gold remains, only streamlined in the necessary amount to be able to fit every song in a not too long album. It’s also not too short or too repetitive as the debut could be and I think it owes that to this influence. There is also a slower and calmer song, the last one. But still sounds very dark despite having only clean vocals. May be one of the best/only examples of very dark music rooted in black metal and exclusively clean-voiced. But this one is obviously softer and more melancholic. The thing I do not like at all about it is just the ending fade out they applied to the music. The fading in sounds are very nice but the fade out is just too fast, something I hate always. Let the music fade away more slowly and you won’t break the atmosphere. Or at least break it abruptly, works as well, to me. And overall, the album sounds very clean and clear, uniquely produced, though it manages to remind to quite dirty sounding classic albums such as Nattens Madrigal (in the sound and fast paced atmospheres) and Transylvanian Hunger (in some hypnotic, dissonant melodies, and that restless pounding). And this one can get nearly as extreme as those and also equally atmospheric; while sounding clearer, more arranged and especially as unique. So yes, there is the need for albums like this one, and the existence of this band is totally justified.